Terry Chan Photography: Movie Review: "National Treasures - Book of Secrets"
Movie Review: "National Treasures - Book of Secrets"
Well, it's Christmas Day, since all the stores are closed, we really had nothing to do other than watch a movie. I've been anticipating "National Treasure 2 (the sequel to the first one), The Book of Secrets" for about a month now. It came out last weekend, but I was just inundated with so much work from SAG and Tiamo Photography, LLC. I haven't had a chance to see this movie. So Lan and I, along with her brother Thanh ventured to the movie theaters today knowing fully that it would be a mad house. While this movie will probably not be nominated for any categories in the Golden Globe Awards , SAG Awards, nor the Academy Awards, it was an exceptionally entertaining movie. Usually, sequels can't live up to the original movie because of the exceptionally high expectation of the viewers, this movie did just fantastic. 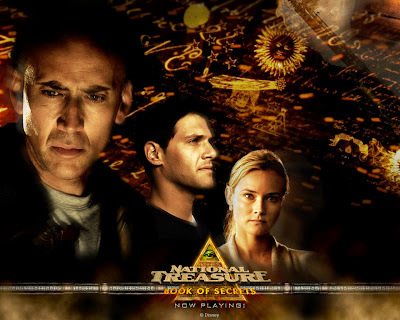 The lead character Ben Gates played by Nicolas Cage, and Abigail Chase played by Diane Kruger (of Troy as Helen) was sparked an intriguing hook to the audience as this time, they are separated and Ben Gates had to move out of his lavish multi-million dollar estate. The ever witty Riley Poole played by Justin Bartha kept me laughing and fully engaged into the storyline of the movie. Jon Voight who portrayed Patrick Gates joined by his movie wife, Dr. Emily Appleton, portrayed by multi-Oscar winning actress Helen Mirren, added to the original movie with a new storyline that alleviates some of the intensity of the movie. I guess that's how they turn a simple movie plot and turn it into a 2 hour + movie. I guess I'm just a "sucka" for a treasure hunting movie, and the intertwine of history and fictional characters just sucked me right in. Yes, I liked "The DaVinci Code" as well. This is a 2 thumbs up movie for me and Lan. Don't miss this movie and keep your eyes peeled for the Blu-Ray disc of this movie.